Call of Duty: WWII is real. Following a series of leaks and unofficial promos, Activision and developer Sledgehammer Games cut through the noise today to confirm the shooter’s period setting, along with a worldwide reveal event for Wednesday, April 26th. The showcase will be livestreamed, too, and you’ll be able to tune in at 10am PT/1pm ET. Aside from some appropriately moody artwork – artwork that features a dishevelled soldier and his thousand-yard stare – no further details were disclosed at the time of writing, only that Activision is poised to lift the curtain on Call of Duty: WWII in a few days’ time. Will you be tuning in? In development for two years, Call of Duty: WWII is set to steer the blockbuster franchise back to its roots following the less-than-stellar Infinite Warfare. A 20th century setting proved to be just the tonic for EA’s Battlefield series, after Battlefield 1 broke past all expectations to become one of the biggest hits of 2016. Can Activision execute a similar feat this year? We’ll have a better understanding of Call of Duty 2017 next week, so stay tuned for more. 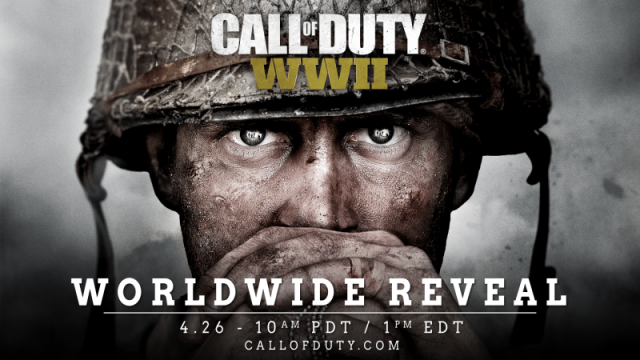 Headed up by Sledgehammer Games, Call of Duty: WWII will stage its worldwide reveal on Wednesday, April 26th, where we’ll surely get a glimpse of the old-timey shooter in motion. Chances are we’ll catch wind of the game’s release date, too, and we all know how Activision tends to reserve the first weekend of November for its flagship franchise. Other titles slated for a similar window include DICE’s recently-unveiled Star Wars Battlefront 2 and Red Dead Redemption 2, though the latter is still subject to delay.